Mercedes-Benz’s AMG performance division’s “43” series so far includes V-6–powered variants of the C-class, the E-class, the SLC roadster, and the GLE-class and GLC-class crossovers. Purists may decry this broadening of the AMG brand—best known for loud V-8 engines, ostentatious styling, and a general sense of excess—as a simple money grab that leverages a hallowed name against a less-performance-oriented subset of buyers. 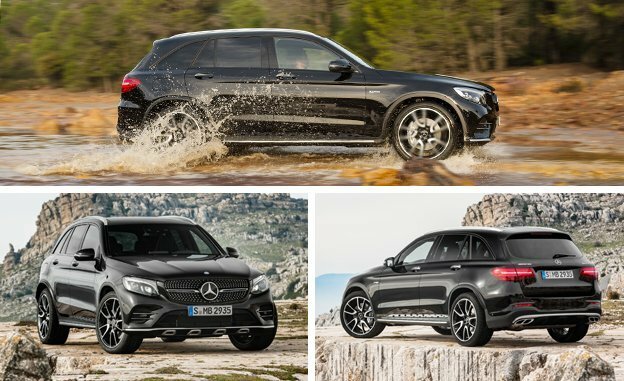 But in the case of the GLC crossover, a sprinkling of AMG’s magic dust takes a competent package and makes it more desirable. Mercedes-Benz couldn’t just stand by while the competition continues raising the performance stakes in the compact-luxury-SUV realm. The BMW X3/X4 range offers up to 355 horsepower, the Jaguar F-Pace launched with up to 380 horses, the Audi SQ5 puts out 354 horsepower, and the Porsche Macan rules the roost with up to 400 horsepower. Thanks to AMG’s comprehensive upgrade, the 362-hp GLC43 aims to run with the best of them, and it looks the part, too. It starts with a tasteful style makeover that gives the GLC some much-needed street presence. An AMG body kit and an attractive grille pocked with pinpoints of brightwork make this GLC look a bit more aggressive but not too flashy. The GLC43 also gets a mean-looking stance, especially when viewed from the rear, where chunky-looking 285-series tires wrap around 21-inch wheels (20-inchers are standard). On our German route near Mercedes-Benz HQ in Stuttgart, the GLC43 proved solid and capable through twisting sections, with a satisfying heft to the steering and well-tuned settings for the standard air springs. On these relatively smooth and well-maintained roads, we found the ride plush and serene in Comfort mode, while Sport and Sport+ weren’t particularly harsh. We’ll have to see if these qualities carry over when driving on broken pavement, but our first experience left us impressed. Despite its higher center of gravity, it’s easy to get the GLC43 into a rhythm through corners, as it has relatively quick turn-in, confidence-inspiring brakes, and lots of lateral grip. It may not be quite as sharp and responsive as the Porsche Macan, which is uncanny in its ability to mimic a sports car, but the GLC43 operates on a similar dynamic level as the sportiest versions of the Jaguar F-Pace and the BMW X3/X4.